A feel-good story from the Cincinnati Enquirer. Until next time, Good day, and good dog! Some of you might remember at the beginning of this school year when I shared a fun “interview” I put together with questions for Essley, with intentions of asking her the same questions on the last day of school (which was last week). The post received a lot of traffic and was pinned quite a bit on Pinterest, so I decided to share the questions and answers here again. (And if you want to see the original post and her answers on the first day, you can do that right here.) Some of her responses were exactly the same, and others had changed. And once again, they were a combination of funny and endearing. It’s just amazing to me how much she’s grown since the beginning of the year. I can’t wait for all of our adventures together over summer break. 2. What grade are you in? 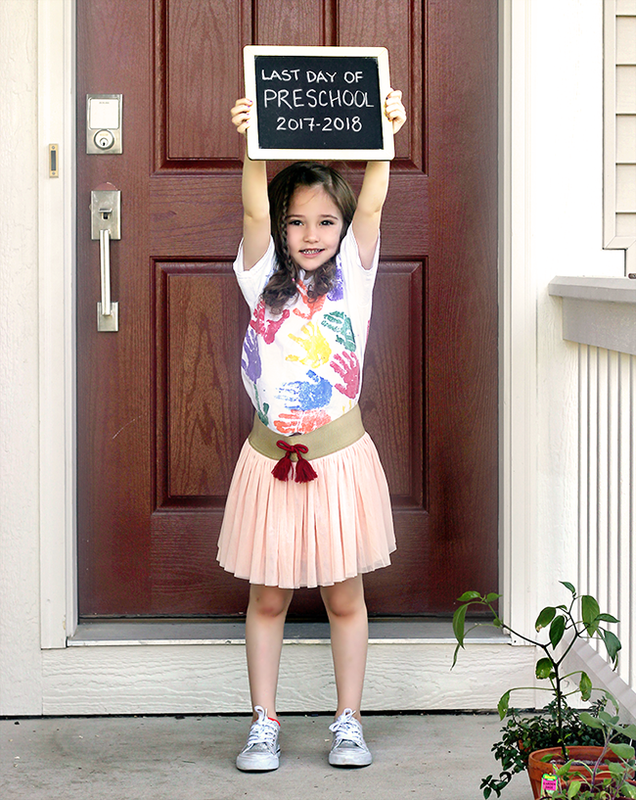 Threes Preschool and next year I’m in Pre-K because I’m big. 3. How old are you? 4. 5. What is your favorite thing to do at school? Play with the building blocks and play with my friends. 6. What is your favorite activity outside of school? Ballet, Tap, soccer, gymnastics, theatre and all activities but not swimming lessons. 7. What do you want to be when you grow up? A dance teacher. 9. How old is your mommy? 30. 16. 10. What is her job? Working on blog posts. 11. What is mommy’s favorite food? Salad and beer. You like beer mommy. 12. How old is your daddy? 19. 13. What is his job? He’s a Stage Manager. 14. What is daddy’s favorite food? Sandwiches. Sometimes he eats hotdogs. 15. What do mommy and daddy like to do? Go to movies and IKEA and to daddy’s work. 17. How old is your brother(s) (and/or sisters)? 2. 18. What is your brother(s) (and/or sisters) favorite food? Mac and cheese. He’s a little piggy. 20. Where do you live? By Chicago. 21. What is your favorite thing to do? Playing with my mommy. 22. What is your favorite place you’ve ever been? The Children’s museum and California. 23. Who is your best friend? Mommy and Livie and Kinsley and Madison and Harper and Sophie and Peyton and all my friends. 24. What is your favorite animal? Zebras and tigers and dogs. 25. If you could have anything you wished for, what would it be? To have tons of animals that I can take care of. If any of you use these question to interview your preschoolers or grade schoolers, I’d love to hear some of their replies! Nicole Renae is married with one child. She and her husband wanted to adopt a dog to make their family complete. Nicole had loved a dog named Chloe when she was a child, but the family had been forced by her father’s job to give Chloe up when she was still young. This time, Nicole was going to keep her adopted dog for good. Halo loves helping shelter animals find their best chance at a forever home. Through #HaloFeedItForward, and our partnership with Freekibble.com, for every purchase made we donate a bowl of dog food or cat food to shelters to help shelter pets have their best chance at finding forever best friends. For one senior dog, she managed to catch the eye of the woman who had been her best friend when they were merely a puppy and a child. Nicole meant to adopt a puppy, but a Facebook post showing a senior dog who needed a home changed her plans. The dog was gray and looked like an older version of the Chloe she remembered. What sealed the deal? The dog’s name was already Chloe! Nicole told The Dodo, “I thought that was such a coincidence,” and she decided to adopt the dog and give her a forever home. When the two met, the coincidences piled up. When Nicole was a child, her Chloe loved to run up to her and lick her face in greeting. The moment that Nicole met this Chloe was magical. “She just ran up to me and started licking my face,” she said. That wasn’t all. “As the day went on, all these characteristics just reminded me of my old dog,” Nicole added. Soon, “I just knew in my heart that it was her,” Nicole told reporters. Even though it seemed impossible, this dog she was adopting as an adult was the childhood dog she had been forced to say goodbye to all those years ago. At first, Nicole’s family didn’t take her seriously. “My whole family thought I was nuts,” as Nicole bluntly put it. However, it was Nicole’s mom who came up with a way to prove that Chloe was in fact, the original Chloe. Nicole’s childhood dog had been microchipped and their old veterinarian still had the ID number. When Chloe’s microchip was scanned, the numbers were a match. It was the same microchip in the same dog. “I literally felt like I’d won the lottery. It was just the best feeling,” Nicole said about learning that her adult adoption was actually her childhood dog. After leaving Nicole’s family eight years ago, Chloe was quickly adopted by an older couple and lived a happy life with them until they passed away. Then she was adopted by another family, but that family had to make the same call as Nicole’s parents and surrender Chloe to a shelter. It turned out to be for the best – otherwise Chloe would never have found her way back to Nicole. “Chloe is happy,” said Nicole. “I think she knows now that she’ll be with me forever.” Now that’s a true best friendship to celebrate! National Police Week is May 13th – 19th. Have you hugged a K-9 today? To all police officers, but especially the K-9 handlers: have a safe week! Until next time, Good day, and good dog!